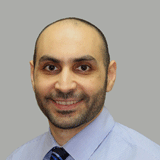 Ahmed studied medicine in Iraq and graduated as a Medical Doctor from University of Baghdad, College of Medicine. He trained in many hospitals in Baghdad, providing superior care to his patients. Ahmed is also skilled in multiple medical administrative jobs. He is known for his passion to participate in healthcare field in multiple aspects. He is also certified by the Educational Commission for Foreign Medical Graduates in the United States. He has spent time in US hospitals and clinics, and is very familiar with the US healthcare system. Ahmed previously worked as care coordinator in a health clinic, overseeing patient care needs. Also he has experience in Medical research, working as clinical research coordinator in Moffitt Cancer Center - Department of Hematology, and as research assistant at University of South Florida, Department of Pathology. He has a passion to pursue patient care from different levels by helping medical offices to achieve their goals of taking care of their patients, as well as facilitate any needs to reach that goal. Ahmed is bilingual, speaking English & Arabic.